The New York restaurant scene is one of the most fiercely competitive in the world, but the newest contender is a clear frontrunner for this season. 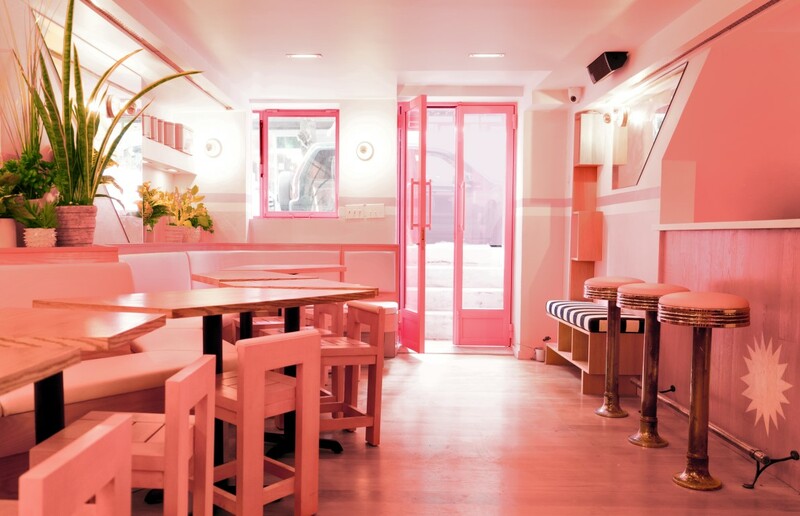 Pietro Nolita is a bright pink contemporary space situated on Elizabeth Street in Manhattan. With an eye-catching pink exterior which is only matched by the bright pink interior this restaurant stands out for all the right reasons. 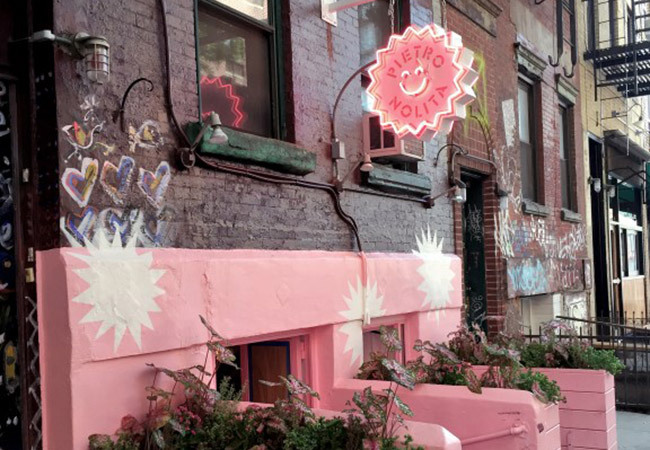 Outside the exposed bricks are juxtaposed against the bright pink entranceway and flower boxes, which lie beneath the neon starburst sign with a smiley face. 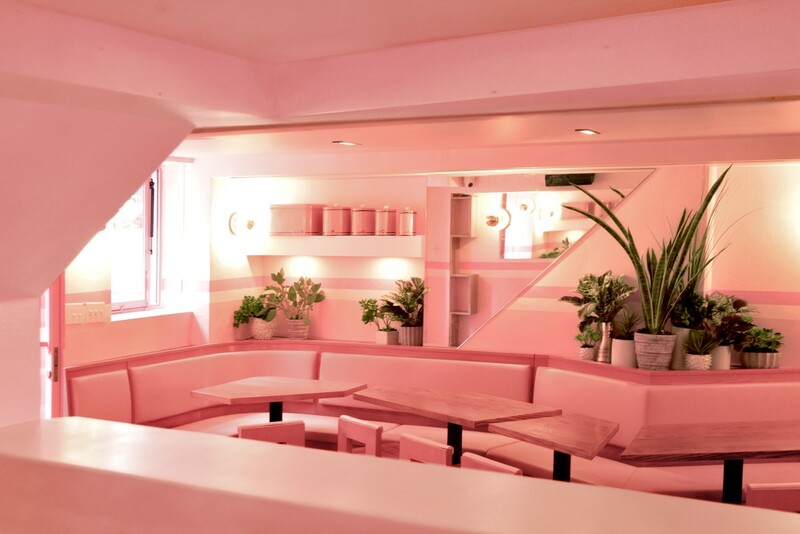 At just under 1000 square feet this restaurant is on the cosy side, with a perfectly pink interior created by the fantastic Jeanette Dalrot which maximises the space. Pietro Nolita’s founders are Pietro Quaglia and Mina Soliman, who first met in 2003. Back then Soliman was working at the iconic Indochine as a maître d’ and Quaglia was interning at Dolce and Gabbana, whose team held ritual Friday night dinners there. It wasn’t until September of last year that they first spoke about the idea of a restaurant when Quaglia found out the space was available by the restaurateur and designer Serge Beckern, whose wife happens to be Soliman’s sister. Soon after these longtime friends became business partners and the story of Pierto Nolita began. 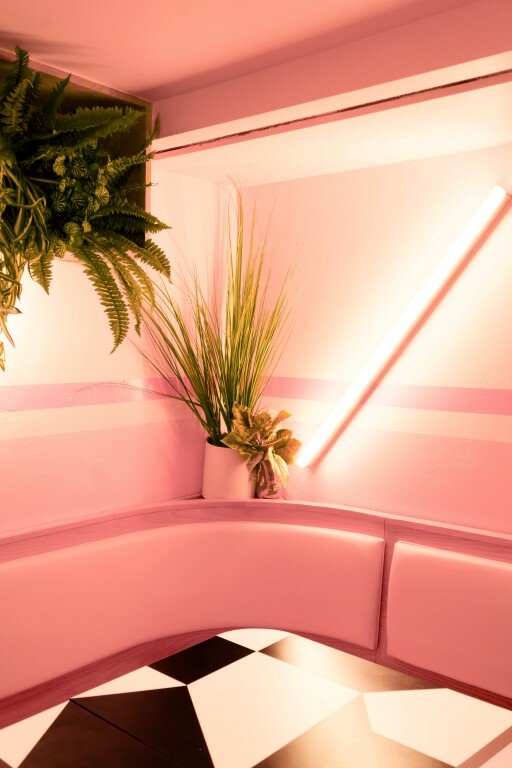 Reminiscent of the pink paradise that is London’s sketch, Pierto Nolita takes this interior hue to a new, and more contemporary level. With hints of Memphis design, the interior manages to fuse retro chic with contemporary kitsch to a successful effect. The light pink walls feature a painted pink and white racing stripe, and all around the pink is offset by plenty of fresh green botanicals. 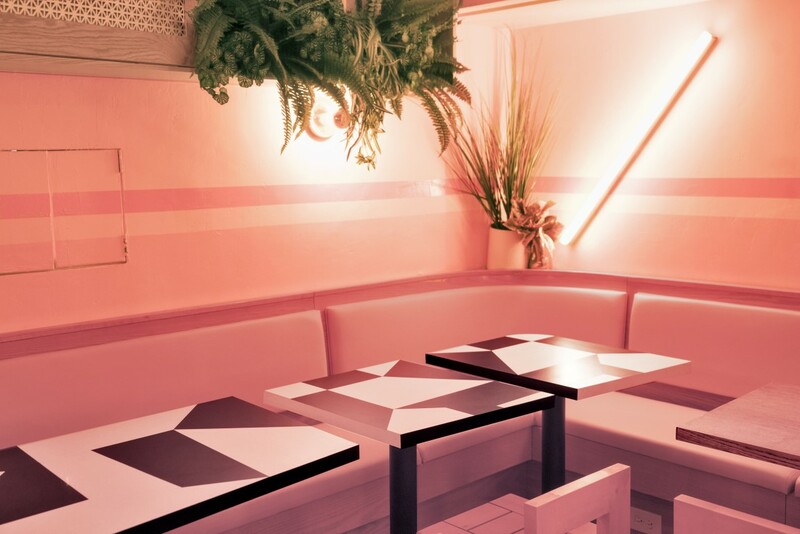 A leather banquette frames the space, set in a pastel-stained wood, and the walls are punctuated by slices of mirror and neon bars throughout. All of the furniture has been custom-made to complement the space, which can seat up to 30 diners. 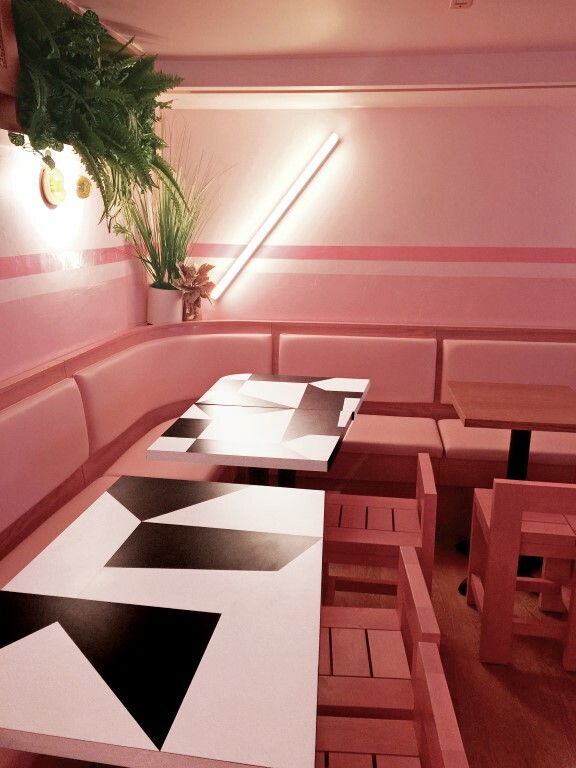 In this unique restaurant it is all about the small touches from the white starbursts hand-painted on the bar and pink vinyl barstools to the black and white graphic formica tables, all of these details are what make it work. The cuisine is ‘healthy Italian’ and is inspired by the cooking of Quaglia’s mother Patrizia Ferrario back home in Milan. 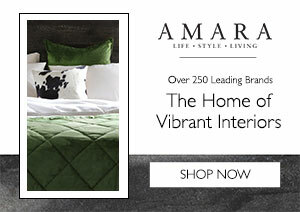 It’s set to offer everything from bread baskets and scrambled eggs to steak with roasted peppers, and faro later on. Fresh pasta will be one of the menu’s highlights, and many are suggesting that the restaurant’s iconic colour could also be taking centre-stage with some of the food too, only in a natural way of course. It will favour lighter, cleaner versions of Italian favourites and in doing so is really carving a niche in the New York restaurant scene. Pietro Nolita is currently in the midst of its soft launch, open for breakfast and lunch only, soon to be open all day. 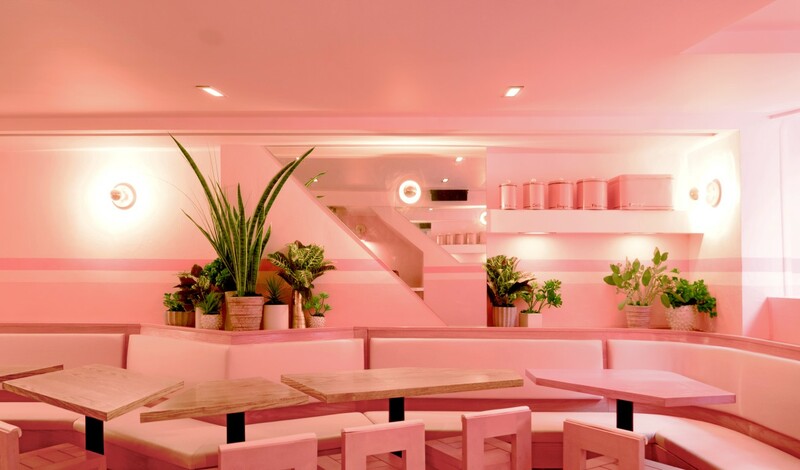 Dubbed as New York’s most Instagrammable restaurant by the Coveteur it’s easy to see why this pink haven is set to become one of New York’s hottest new spots.